A great white shark is pictured in the eastern north part of the Pacific Ocean. Summer is here, and with it the number of people going to the ocean to swim, play and cool off skyrockets. These short few months are also the time of year when more shark sightings are reported, and shark hype and panic typically peaks as well. When humans spend more time in and on the ocean waters, it is considered inevitable that the reports of shark sightings will rise. And while many of these reported sightings are never actually confirmed, the very suggestion of a shark close to shore is enough to send some people into panic mode. Is there a reason to panic? Do beach goers have to worry about the sharks that have always frequented the ocean waters? Are the Maine and New Hampshire coastal waters safe for swimmers? What types of sharks are common in Maine and New Hampshire waters? “Some of the common sharks we see in these waters are spiny dogfish, porbeagles, sand, tiger and basking,” Sulikowski said. Sulikowski is a shark expert and has spent several years studying and researching the sharks of Maine waters. Saco fisherman Garon Mailman said he comes across a variety of sharks while working daily on the ocean. “I have seen mako, porbeagles, blue sharks and threshers in Maine, and, yes, there are great whites out there from time to time,” he said. Where, exactly, are the sharks found? Sharks are migratory and do not spend great deals of time in one particular area, which should also ease the minds of those who believe they may have seen a shark close to shore. Sulikowski and his team tagged a baby porbeagle shark in 2012 with a geolocator. Data from the device recorded that in the course of a year, the shark traveled from Maine, up to Nova Scotia, Canada, down to South America, past Panama, Cuba, into the Gulf of Mexico and back up the Atlantic coast into the Gulf of Maine — finally returning to the same spot where it was tagged exactly one year prior. “When you start getting out to sea about six miles, you really start to see sharks,” Sulikowski said. With the exception of basking sharks, which are plankton eaters, large shark species such as the great white shark typically prey on seals. 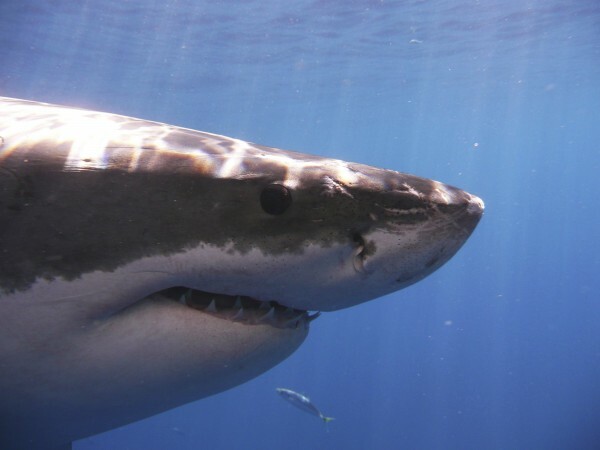 “Great white shark sightings are very rare here, though I suspect we will be seeing more of them in the coming years as they prey on seals and the seal population is growing,” Sulikowski said. Even so, this still is not a reason to panic. Sulikowski said it is also important to remember the sighting of seals close to shore does not mean sharks are lurking around them. What may cause a shark panic? Basking sharks are often confused with great white sharks when they are seen close to the shoreline. These sharks have the typical shark fin, grayish coloring and are large in size, averaging 19 to 26 feet in length. And though they may look ferocious, basking sharks are plankton eaters and pose no threat to humans whatsoever. “We saw one [a basking shark] just the other day about two miles from Wood Island in Saco. Basking sharks are definitely in the area right now,” Sulikowski said. What are the chances of someone seeing a shark or getting attacked? The chance of actually seeing a shark close to shore is extremely low. If you do see one, consider yourself lucky — it is a sight most people will never get to see and it is an indication that the ocean ecosystem is healthy, experts say. The chance of being attacked by a shark is even lower. In fact, the track record for shark attacks in Maine and New Hampshire is spotless. “Since the 1600s, there has never been an unprovoked recorded shark attack in the state of Maine either close to shore or miles out to sea.” Sulikowski said. And New Hampshire can make the same claim. According to published reports, there were only five attacks during all those years in New England — four in Massachusetts and one in Connecticut.